28.5 by 26.5cm. ; 11.25 by 10.5in. ,p. The Cripples (1949, The Lowry, Salford) is a painting that stands at a significant point in Lowry's development, yet it was not until over a decade after it was painted that it would become apparent why this was so. Even to those who are familiar with Lowry's work beyond the core repertoire of mills and streets, its concentration on this motley collection of unfortunates, painted large and with an unflinching eye for detail, is tough. Whilst Lowry had always produced work with larger figures that allowed for a greater level of detail and characterisation, it was only in the later 1940s that this began to become more common. In the 1950s increasing numbers of his paintings were reducing the industrial landscape element to a notational backdrop, the people stepping forward to take centre stage, simultaneously becoming more real and human. By the 1960s one frequently finds Lowry complaining that he is no longer interested in painting industrial landscapes; it is figures he really wants to paint. Looking back to The Cripples, we can see how it is both a distillation of so much that had gone before and also a pointer towards what was to come. The genesis of this large painting is well-entrenched in the Lowry canon: seen in an early stage by Lowry's friend, the painter David Carr who had queried the veracity of such a range of unfortunates, Lowry and Carr took a drive, spotting, it was said, 101 between Manchester and Rochdale. Carr received updates in some of his letters from Lowry as to how the painting was progressing, 'Here The Cripples are very good and behaving themselves and none of them are undergoing any operations at present' (The Artist, in a letter to David Carr, 2nd November 1948). But one cannot escape the feeling in the final painting that we are seeing something that one does not generally associate with Lowry, an element of mockery. In virtually all Lowry's earlier paintings of figures somehow on the 'outside' in some way, one is always struck by his essential humanity in his treatment of the subject. Never flinching from the reality of those dealt a poor hand in some way, there is always a detectable sympathy, a feeling that it can be just a trick of fate that means it is not us, or indeed him, sleeping on a park bench or crippled by the childhood diseases or work accidents so prevalent at the time. War too had added its own swingeing and random weight, and especially in the years following WWI, the period in which Lowry pictorially remains for much of his life, those who had been in some way affected would have been commonplace. Throughout his paintings we see malnourished and bow-legged children, women broken by repeated child-bearing, men made old before their time by working conditions that defy modern norms. Yet they are not oddities, they are part of the world that Lowry aimed to bring to notice and without them there his work would lose its veracity, its sense of understanding. The present work does not lack in its observation, but it is so noticeably different in character to The Cripples that it is initially difficult to associate it with the larger painting. Whilst Lowry's usual practice was to date his paintings at completion, the simplicity of this painting has much in common with other depictions of two or three figures from the later 1940s, and thus whilst both paintings are dated 1949 (we see from the letters to Carr that the large painting was well underway in September 1948), we must consider it to be a study for the equivalent grouping in The Cripples. However, whilst the pose and positioning of the two figures is identical in both paintings, the connection between the figures is clearly different. Here, the men are clearly young, indeed almost boyish. Their dress suggests they are down on their luck, but there seems to be something in their interaction that hints at a mutual assistance through these bad times. 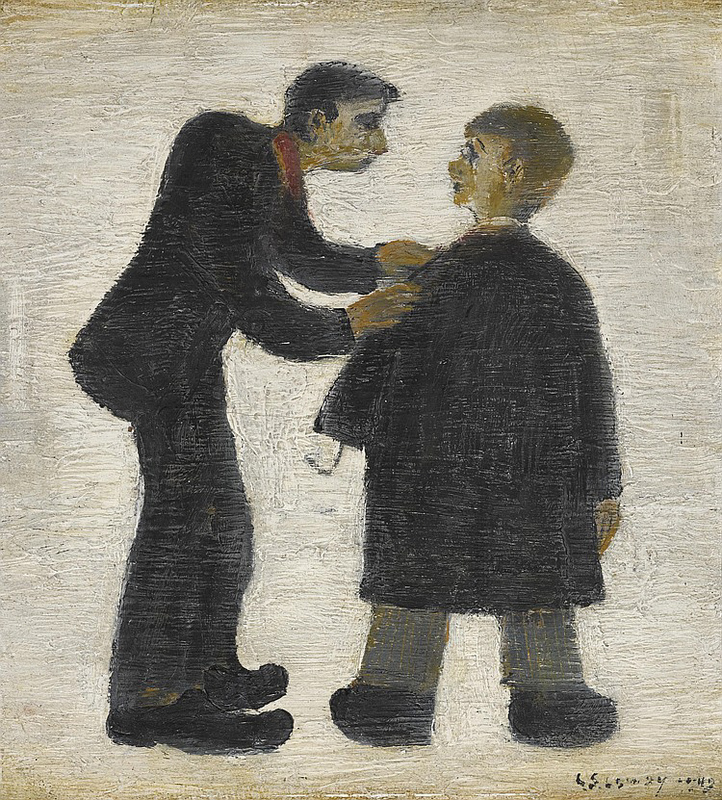 There is a tenderness and sympathy in how Lowry presents them that immediately feels genuine. The same might be harder to argue for the pair in the Salford painting. Made much older by the artist, there is a cantankerous quality here at the fore, old men grumbling at their lot. Within the context of the larger composition, they have become caricatures, amusing 'types', their vulnerability somehow lost. As one moves across the many figures of The Cripples, only two characters do not seem to be subject to the mockery that is hinted at elsewhere. Both look directly at us, the figure propelling himself on a wheeled skate (Andras Kalman recalled the familiar character in Manchester who was the source for this figure) and the central man, who, apparently barely held up by his crutches, stares out at the viewer. It is possible to see in this figure characteristics that via paintings such as Head of a Man, 1938 (The Lowry, Salford), which has strong self-portrait elements, clearly suggest that the artist is presenting himself as perhaps the chief amongst cripples, someone surpassing the caricatures around him.